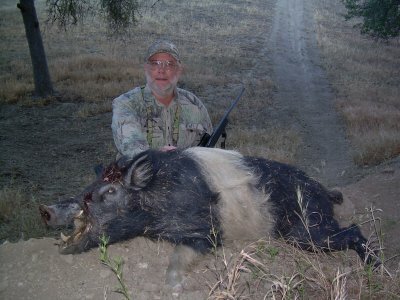 For our Pig hunt in 2009, we booked with guide Bert Claassen, planning to hunt the Jack Ranch, after hunting the Work Ranch the previous year. But during the off-season Bert lost the hunting lease for the Jack Ranch, due to a shakeup in the management of the ranch ownership. So we adjusted our schedule and booked back on the Work Ranch. Bert warned us that Pig hunting had been difficult. I knew he had been hitting them hard because of the other hunters like us that had to move over from the Jack Ranch. But the only hunting that matters is today's hunting, so we set out with high hopes. Our first evening hunt we setup on a stand on property above the ranch headquarters. We soon spotted a group of 3 adult Pigs, with a bunch of little ones running around. After glassing them for some time Bert tells us that only one of them is wet (nursing Piglets) and describes which one we should NOT shoot. Ron and Jeff were first up to shoot. Bert says to go on down and try to take the two Pigs while he heads back up the mountain toward the Jeep. I decided to accompany the shooters. They worked their way down the mountain side into a slight gulley that would conceal their final approach, and I side hilled to the right where I would be concealed and have a good vantage point looking down on both the shooters and the Pigs. Ron and Jeff get set up in position. The Pigs are nervous and suspect something, but they wait to long to run for it and pay with their lives. Ron counts 1-2-3, and bang! 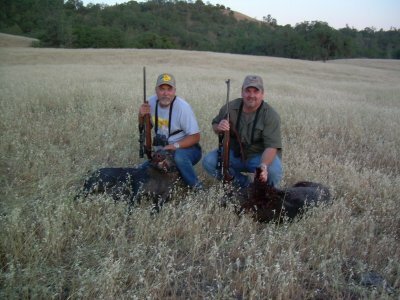 Two Pigs down on the first evening. It's just about dark when we load them up and head back to the house for a delicious dinner. We had 2 of our 3 Pigs down on the first night. So we just needed to get mine this morning. We were on stand at about 5:30AM and glassing the hills. We saw one Pig to the northwest out pretty far, and another to the southwest that looked wet and might have had a brood around her. So Bert thought we should try for the lone Pig to the northwest. We jumped in the jeep and he drives like a madman over a maze of ranch roads, probably about a mile. We get there and creep up over a hill where he thinks we will be able to glass the Pig again. The Pig had actually moved toward us and we caught glimpse of his back above the grass very close. All four of us tried to work our way up to where I could get a bullet into vitals above the grass, which was a mistake because a group of 4 guys does not make a stealthy approach. Anyway, before I could get a clear shot the Pig either heard us, or more likely saw us as we were only about 50 yards away and a big group. Even Pigs can see something like that. He spun around and I snapped a shot as he was going over the side of the hill, but there really wasn't much chance of connecting and it was a clean miss. I'm thinking that it's over on this Pig, but Bert knows these animals and the ranch so well, that he is pretty sure where the Pig will go. He jogs us back to the jeep and we really race this time back the way we had come. I'm wishing I had a seat belt about that time. We were slowing down a bit to watch certain areas for a glimpse. Finally he gets to a spot where he believes the Pig has to cross and we stop and get out. He had us looking the wrong direction for the most part, but in a matter of 2 minutes or so one of the guys spotted him across a ravine heading toward us. That white stripe made it pretty obvious it was the same Pig. So he is heading for the side hill across the ravine which has a few openings between the trees and brush. Measured it later at 230 yards. The Pig is crossing at right angles to us, slightly below our elevation. I'm in a good sitting position, ready for a shot and Bert says he will try to stop the Pig. Just when he reaches the largest clearing, Bert yells something and sure enough the Pig stopped broadside with his head turned straight at us. About 1/4 second later the shot was made. I pulled the shot just a little to the left, and it was a head shot. His head was turned sharply toward me, and instead of the shoulder I hit the center of his forehead. I was probably 6" too far to the left, but elevation was correct. He went down like a ton of bricks and rolled almost to the bottom of the ravine, squealing like - a Pig! Amazingly, he kept kicking for a while to the point where Bert was afraid he was trying to stand up so he had me put one more in him. That one I slipped right behind his ribcage forward into the vitals and it was over. You really don't expect to need a second shot when you've hit them in the head. Tough animals! It was 6:05AM and we were done. I must confess the Pig is not as big as the photo makes it appear. I would guess between 165 and 175. Small enough that he should be fine eating. 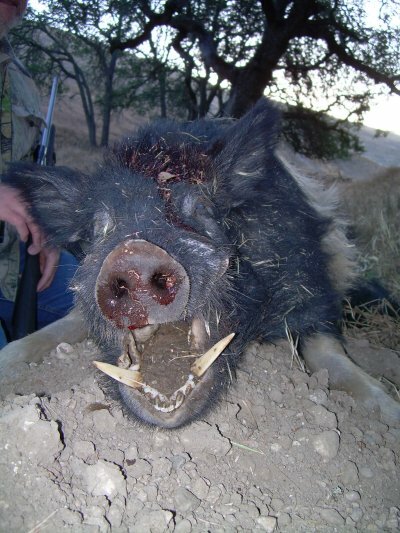 But he had very impressive teeth for a boar that size. 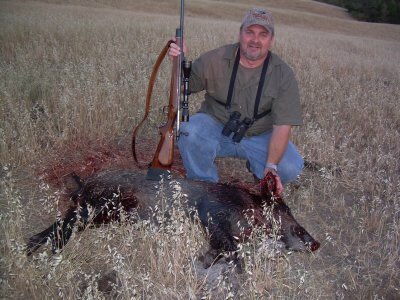 Ron, above, with his Pig and his custom Mauser .260 Remington. 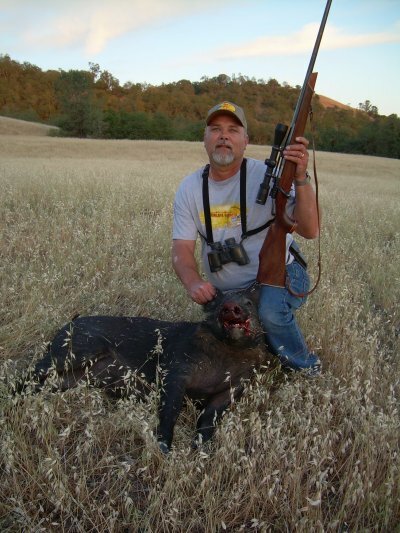 Jeff, above, with his Pig and his Remington BDL in 30-06. Ron and Jeff, above, after we had dragged the Pigs together. Above is my Pig, posed on a dirt bank. Here is a closeup of my Pigs teeth. Pretty good dentures for a Pig this size. 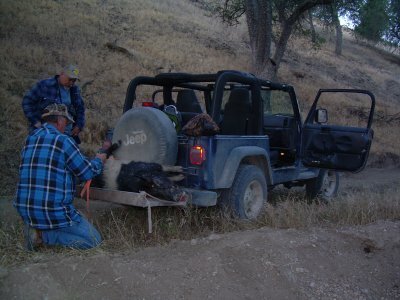 Here is the Jeep we hunted from this year. Bert is tying my Pig to the hitch mounted rack.